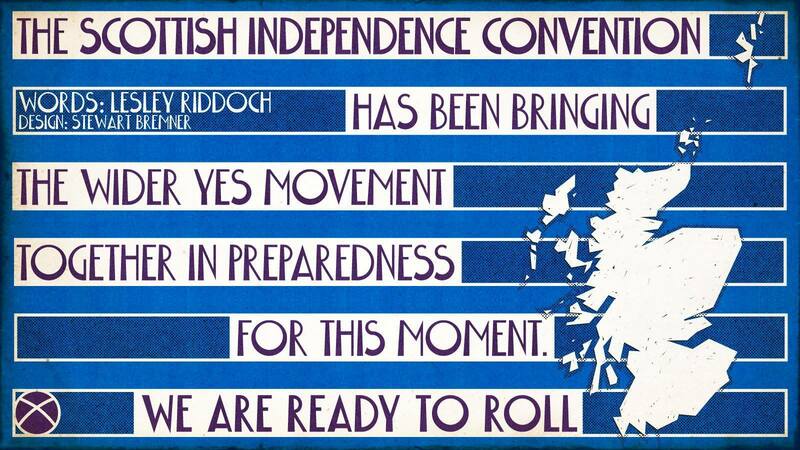 The Scottish Independence Convention, the umbrella body for the Scottish independence movement, today said it is well into preparations to fight and win a new independence referendum. The Convention brings together all the independence-supporting political parties (SNP, Greens, SSP), the national independence-supporting organisations (Labour for Independence, Women for Independence, Yes2 Business for Scotland, NHS Yes, Radical Independence Campaign, Common Weal and a range of others) and representatives of local grassroots groups. Plans for a fundraising programme are also underway. “Representatives of all parts of Scotland’s independence movement met yesterday in Glasgow to finalise details of the work programme we are putting in place to get us ready to fight and win a new referendum for Scottish independence. “Our movement is deep and wide. Our many people are strong and committed. We are determined not to rest until we rescue Scotland from being dragged into an era of intolerance and a politics of isolation. “For those of us who think that indy in the EU is both an economic and social necessity, and a huge opportunity to launch Scotland as a nation-brand across the planet, I am delighted that Nicola has decided to go for a Scottish referendum before the Brexit negotiations conclude. “The arguments against the Union are stronger than they’ve ever been. However I think the sense of realism about how much work an indy Scotland will be in the early years is also now generally understood. “But this time, it’s the ultimate choice. If we don’t win this argument for indy, faced with the extreme inequalities and harshnesses that Brexit will bring, then we can certainly put the constitutional question to rest in Scotland, for this generation at least. “Nicola Sturgeon did the smart, bold thing today by getting ahead of the Brexit curve, surprising the commentators and reasserting Scotland’s right to decide its own place in Europe and the Union. Speaking in Bute House rather than the SNP conference, the IndyRef2 announcement about was made as First Minister of Scotland, not leader of the SNP. That’s an important distinction. “Since the Brexit vote, Nicola Sturgeon has clearly sought to advance the interests of the 62 per cent for a differentiated deal within the United Kingdom – and she has proved that “parity of esteem” and “a partnership of equals” are just hollow words. This time round Scots can make a more informed choice – knowing that the only way to stay in the EU or within the single market is to vote for independence and knowing there is no chance of a confused and collapsing Labour Party changing the free-market, isolationist direction of the United Kingdom for years, maybe decades.